Fifteen-year-old girl looks out from a transit center in Guatemala City. As mothers searching for the whereabouts of their migrant children amassed last weekend in Mexico City, a historic nine countries were represented, as well as the United Nations International Organization for Migration’s (IOM) Missing Migrants Project. 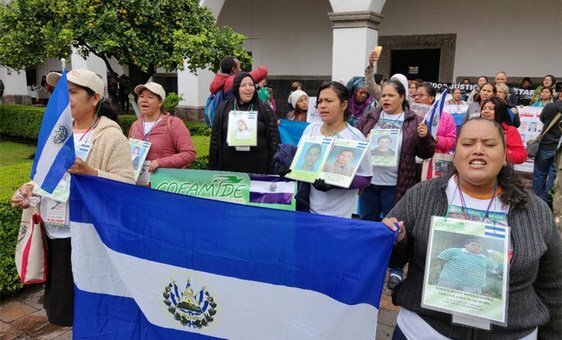 For the first time ever, the so-called Caravan of Mothers of Missing Migrants – who, since 2005, have crossed Mexican territory each year to raise awareness and search for lost loved ones – was joined by mothers from other continents, building a transnational movement to underscore that one death or one disappearance is one too many. Over 40 mothers and other family members from El Salvador, Guatemala, Honduras, Nicaragua, Mexico, Senegal, Mauritania, Tunisia and Algeria shared their stories, built ties and exchanged experiences on searching for the whereabouts of their children. Rosa Idalia Jiménez has been looking for her son since 2013, fleeing poverty and violence in his home country at age 14 for a safer, better life. Rosa shared her story at the first-ever Global Summit of Mothers of Missing Migrants, which took place in Mexico City from 2 to 4 November. The disappearance of a loved one, no matter the context, leaves a family mourning, or waiting for news. Caught between grief and hope, their search for information can take years or a lifetime, pointed out IOM. “Coming together around such tragic circumstances, the mothers can share their stories of pain, grief, and, above all, endless love for their missing children,” IOM said. Along with mothers, sisters, brothers, fathers and grandmothers participated, each wearing around their necks photos of their missing relative. Each hoping that someone will recognize their loved one and be able to help find them. For three days they discussed many obstacles throughout their searches. “Without national or international search mechanisms, families are left to navigate a confusing web of institutions and bureaucracy with little state support,” IOM explained. By Sunday, participants had mapped out a plan to globalize the struggle of families searching for missing migrants, collaboratively drafting a manifesto that sets out the mothers’ demands for truth and justice for their missing children. They agreed on a list of actions, which include joint advocacy campaigns, regional initiatives and an online coordination platform – marking the beginning of a global movement. 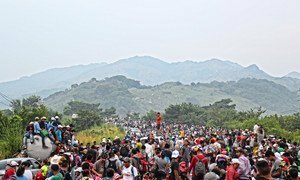 The summit was convened by the Movimiento Migrante Mesoamericano and the Italian Carovani Migranti, two non-governmental organizations that assist mothers and families of missing migrants in Central America and Italy, respectively.